If your manufacturing business is held back by the limitations of an aging technology ecosystem, you’re not alone. Business growth, regional and global expansion, cross-enterprise visibility, inventory accuracy, and data accessibility represent some of the toughest challenges faced by your manufacturing peers. Enterprise resource planning (ERP) software is the backbone of modern manufacturing information systems, enabling the digital transformation that’s changing operations and customer expectations. As the movement toward digital transformation evolves, your ERP system must keep pace. 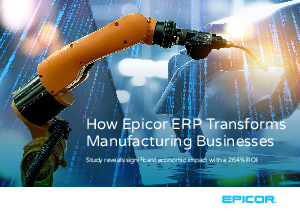 Read the ebook to see the highlights of the main points from a commissioned study conducted by Forrester Consulting on behalf of Epicor, “The Total Economic Impact™ of Epicor ERP,” to find out how Epicor has helped manufacturers improve efficiency, customer responsiveness, and cost savings.